For months relatives of the forcibly disappeared have been protesting on the streets across the North-East, demanding to know the whereabouts of their loved ones. Despite years, sometimes decades, of various government mechanisms and pledges, their search for answers continues. 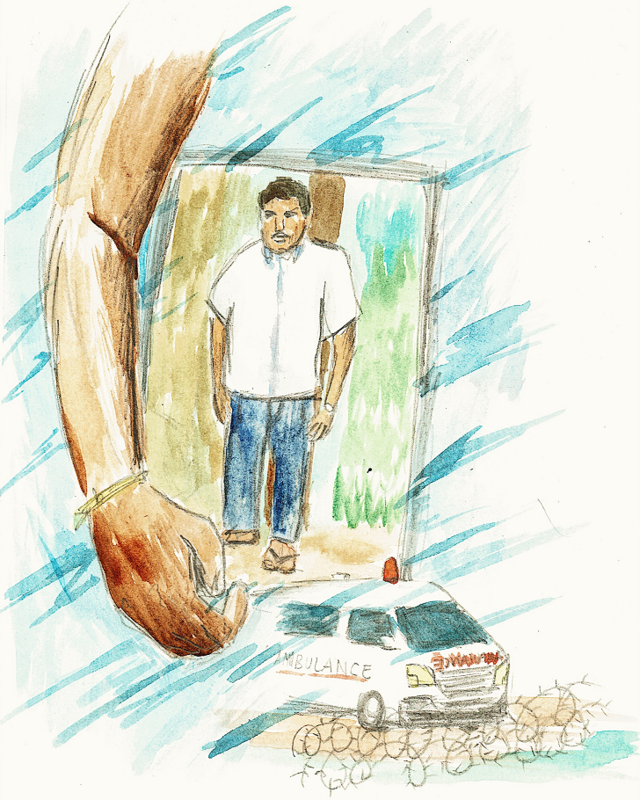 In this series of interviews conducted since May 2017, Tamil Guardian goes behind the protest to the individual stories that make up this unyielding movement of Tamil families of the disappeared. During the closing weeks of the armed conflict in 2009, Sinthanaiselvan had fallen ill. Amongst the hundreds of thousands of Tamil civilians holed up in the final conflict zone, his health had sharply deteriorated as disease spread amongst the displaced. Though he normally carries a large frame and big build, he had begun to lose a lot of weight. “There was no food or water,” says his mother Sarojini. She is part of a group of mothers searching for her disappeared child. “At this point, there were also shells being dropped and we could not run,” she adds. The Sri Lankan military was in the midst of a massive military offensive. Thousands had already been killed by the widespread aerial bombardment. Many more would be slaughtered in the weeks to come. Selvan, as he was known at home, had contracted shingles says Sarojini. The disease is infectious, caused by the same virus that gives children chickenpox, spreading easily and rapidly through close contact. Usually it is self-limiting and leaves a mild itchy rash that clears up in a week or two. In adults however, shingles can have serious complications, causing painful blisters and searing fevers. 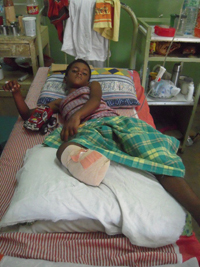 As his health worsened, he was forcibly displaced alongside hundreds of thousands of others as they dodged Sri Lankan artillery fire. “I held on to his arm and was fleeing the area but on the way he fainted because of the lack of food,” Sarojini continues. It was May 16th 2009. From that day onwards, she has been in a desperate search to find her son. Selvan was taken by the Sri Lankan army and transferred to an undisclosed location. Though he required urgent medical treatment, the military did not tell Sarojini where he was being held. “We went to many hospitals with my son’s picture,” she says. The first placed they searched was Vavuniya Hospital. The government had barred international humanitarian organisations from entering the conflict zone, but had granted limited access to a few groups to operate from Vavuniya, such as the International Committee of the Red Cross (ICRC) and Médecins Sans Frontières (MSF). Thousands of patients had been treated and operated on there, many for blast injuries. Vavuniya Hospital in 2009. Photograph: MSF. Her search for Selvan became frantic. Armed with a picture of her son Sarojini travelled across the whole island, searching hospitals for news of him. From Vavuniya she travelled to Mannar. From Mannar to Colombo. From Colombo to Angoda. She enquired about him at every single stop. “When we asked at each hospital or camp they said they did not know,” she says. At Angoda, hospital staff told her to try looking in Kandy. It was there that she finally discovered more news of his whereabouts. “A nurse there saw my son’s picture and said, ’We treated him here’”. The nurse reported that Selvan was said to be an LTTE doctor and there were two Sri Lankan army guards constantly watching over his bed. The nurse at Kandy checked their records and confirmed that Selvan had been admitted from June 1st 2009 until the 5th. He was a patient on ward number 28. Hospital documents showed that on discharge, he was taken to Padaviya. "There were lots of children inside,” she says. “If they were not doing anything wrong they could have let us in to see. We could have seen our children that way if they let us. But they did not show us.” She still has not been inside the Padaviya camp. In the years since that encounter, Sarojini and her husband have been agonising over the fate of their son. In December 2012, the family received an anonymous phone call telling them that once “investigations are over” Selvan would be allowed to return home. “When we tried to call the number back it did not work,” she says. Since then, no more calls have come and officials have always denied knowledge of his whereabouts. They have no further information on where their son is. “Wherever they are, in whichever way possible, you need to find our children,” she pleads.